Are you a military wife or a military husband? Is your spouse currently deployed? Do you have young children at home? Would you like to have a life-size cut-out of your military spouse to incorporate into your daily life with your children? Flat Mommies and Flat Daddies to the rescue! 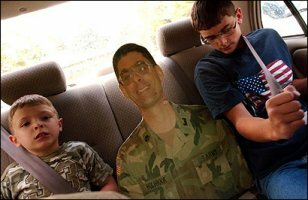 Flat Daddies is the name of the organization providing life-size cutouts of deployed service members to their spouses, children, and relatives back home. They are life-size 2-dimensional cardboard cut-outs that enable you to have your loved one around… even when he or she is gone. Read about the story behind Flat Daddies and how Flat Daddies got started. Flat Daddies can ride in cars, sit at the dinner table, watch as children do homework, play on swings, visit the dentist, attend weddings & funerals, and even appear in photographs! Check out this MSN video about Flat Daddies. One free (plus $9.50 shipping & handling) Flat Daddy or Flat Mommy lifesize cut-out is available to the spouse who is directly affected by the deployment of a soldier. Others affected by or interested in receiving or sending a Flat Mom, Dad, Son, Daughter, Sister or Brother can do so for a nominal fee. To get yours, simply choose your option: Military Spouse or Military Relatives, then complete the online form, and upload a photo (between 400KB and 2MB) of the person being deployed.